Our 'Fun Casino Hire' offers the best value for money in the UK & as every occasion is different, we will cater to your needs - from a small intimate dinner party at home to a multi casino table corporate function. Whatever the event we offer the same attention to detail & the very best in fun casinos. So, relax, sit down, enjoy & let Oceans 3 Casinos do the hardwork, fun casino hire with modern gaming tables, casino style chips & professional lively staff. You will be pleased to know that we can set-up your fun casino absolutely anywhere, to suit any budget & any occasion. Big or Small........We Fun Casino for ALL! Ideal for weddings, birthdays, corporate events & parties of all types. Fun casinos are also ideal for fund raising & charity events. For that special night what about a 'Las Vegas' or 'James Bond' Theme Night! 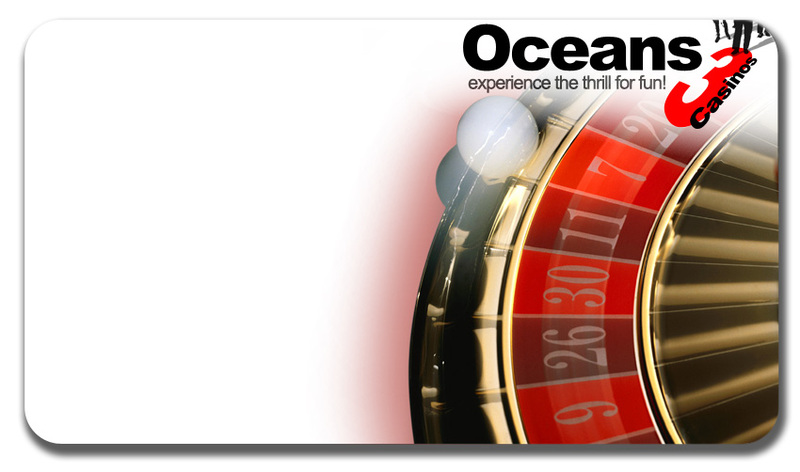 We will supply all those casino favourites - Roulette, Blackjack etc. in fact everything you need for a fun & enjoyable 'Las Vegas' style casino. Just come along with a smile, but don't worry if you forget the smile, we'll put one of those on your face for no extra charge!